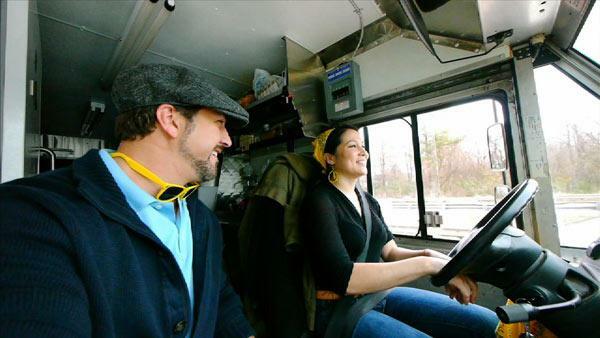 After getting the tasty dumplings made and loaded on the truck, Chela, Nate and Joey hit the road where Joey finds out how their dream of owning a food truck all started. Joey hooks up with Chela and Nate, two of the owners of the Chirba Chirba truck, to get it loaded and on the road. This crowd that gathers at the Chirba Chirba truck doesn't mess around when it comes to authentic, delicious Chinese dumplings! Joey works the truck along side Chela, Nate and brother Josh as lunchtime approaches. The Chirba Chirba truck is part of a larger, nation-wide food-truck movement that is sweeping the land. See why this is fast-becoming a fun way to sample gourmet food from the convenience of your workplace parking lot. Chirba Chirba shares a recipe for chive dumplings.